Replica windows are the answer for the homeowner who needs to replace their replacement windows or has an un-restorable original window. Heirloom Windows specializes in manufacturing replica windows. Until recently they offered only one, very popular product, geared toward energy efficiency using insulated glass. (see Magnum Series below). However, they report many customers requesting single glazed (non IG, monolithic) replicas, wavy glass and/or ”True Divided Lite” windows and as a result have added these options to their product line. Under the right circumstances, they can even integrate into the replica window the newest glazing technology Vacuum Insulated Glass (VIG). Regardless of the glazing configuration option chosen, Heirloom Window products insure that historic proportions and style is maintained while eliminating air-infiltration with contemporary, completely hidden weather-stripping. The following is a guest post explaining these products that are recommended by Old House Guy. Heirloom Windows is pleased to announce new glass options and configurations to their Replica Window product line. All Heirloom Window have the following features in common. The various glazing options appended at the end. Unlike other window manufacturers, Heirloom Windows does not brag about energy savings, convenience, cost savings or any of the sales pitches heard elsewhere. While their products do provide those advantages, their primary concern is helping people with vintage homes replace their windows with the most historically accurate product possible. 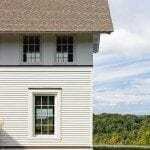 In all Heirloom installations, one cannot discern it’s not the original window from greater than five feet distant – certainly not from the “curb”. Below are many of the elements that Heirloom has considered when designing their products, most of which concern appearing as authentic and historic looking as possible. More details can be found on their website heirloomwindows.com . One of the most glaring problems with contemporary window systems is their “anemic” appearing window casing (3.5” vs 4.5” – 5.5”). That problem does not exist with the Magnum, since it’s a “Replacement Sash System” that utilizes your extant window casing, jamb and frame, only replacing the sash, while adding contemporary weather-stripping. You get to keep your original jambs and interior and exterior casing. This eliminates the inconvenience, terrible mess and expensive labor required to repair plaster and clapboard when replacing the entire window system (sash, casing, jamb and all). The second most distinguishing characteristic of older windows is sash and muntin geometry and sizing. In their quest to satisfy your desire for historic accuracy, Heirloom will match your original muntin and top rail geometry right down to the muntin width (some are 5/8”, most are ¾” while others are 1 ¼” – 1 ½”) and geometry (round, arched, gothic etc.). Likewise, to ensure historic accuracy and continuity with the rest of the architecture, Heirloom will paint the exterior and paint or stain the interior of your sash to your color specifications. Stiles are the vertical and rails the horizontal pieces of wood in a window sash. It might not be immediately noticeable, but the width of the stiles and rails and their relationship (ratio) to the glass have a significant effect on the appearance of the window. Older windows tend to look more delicate (less frame – more glass). Heirloom is one of the only companies that makes the stiles and rails the same dimensions as your originals. This means your windows will maintain that authentic, delicate look. 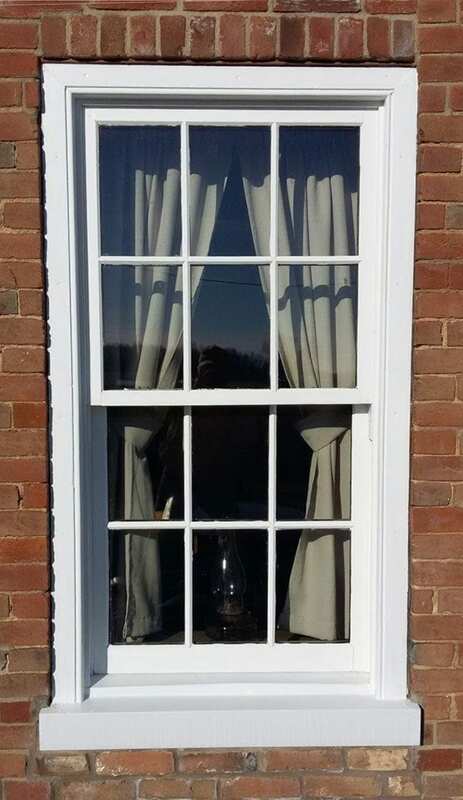 Conversely, for a sash to “tilt in” there must be an unsightly, visible band of plastic around the interior perimeter of the sashes and it requires a “fatter” jamb liner to accommodate the tilt hardware, thus adulterating the glass/wood ratios (more frame – less glass). Heirloom’s clients universally reject the compromises required for this feature. Measure the depth from the interior edge of your original sash to the glass. It will be within an 1/8” of 7/8”. This depth is a major factor in the “character” of your windows. Heirloom Windows is dedicated to maintaining that profile depth of the stiles, rails and muntins to preserve the richness of appearance. Heirloom Windows uses only through and open, square, mortise and tenon joinery which is the time tested, industry standard, for making rugged window sash frames. This method requires much more equipment, tooling and time but it makes a better joint that will last for generations. Other small window manufacturers, as well as some of the bigger ones, use easier joinery methods, such as round end tenons, dowel pins, biscuits, splines or pocket holes. There is (or should be) a noticeable line where the rails (horizontal) land on the stiles (vertical) on both the interior and exterior of a traditional window sash. Many companies offer thin plastic or aluminum exterior cladding that are usually mitered at the joints. This is a dead giveaway that a window is a “clad replacement” and why many historic HOA’s and commissions demand solid wood replacements. Amazingly, the Magnum has an exterior that is as authentic, yet as maintenance free as one can imagine. Heirloom uses a full ¼” of “Boral Truexterior ”, cut exactly like the stiles and rails so the joints are precisely where they would be if they were wood. 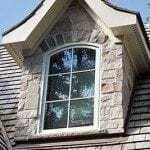 Furthermore, the ¼” exterior window sash surface is also the glass stop, beveled to the glass to replicate putty glazing. Even on close inspection one cannot determine the surface is not wood, glazed with putty! The material holds no moisture and therefore paint last many times longer. You will never have to re-glaze and the lifetime exterior paint should last that long too! Should your HOA or local historic commission prohibit anything but wood exterior, Heirloom will gladly help you seek a variance. Not only has this been done successfully in the past, but these entities have actually become Heirloom Window advocates after seeing the Magnum’s advantages. Wood cladding can also be used if all else fails. All Heirloom replacement window systems have jamb liners which are also made of maintenance free material. Once painted into place they are unobtrusive and function to cover and protect your existing jamb sides, particularly where they meet the sill and are prone to degradation. Once installed they are practically invisible. The system has provisions, if necessary, for covering and protecting deteriorated sills as well. Like practically everything else in the world, weather-stripping technology has improved exponentially over the last 50 years. New pile seals for sliding applications no longer “shed” their fibers and compress. Top quality bulb seals now have no “memory” and continue to return to their original shapes to maintain the proper compression. Heirloom incorporates all these contemporary components into their replacement windows, but you’d never know it, because they are all completely hidden from sight, quietly and invisibly eliminating air-infiltration. Heirloom Windows has designed our replacement sash sets to be installed from the interior by a competent DIY’er in 1.5 – 2.5 hours. Through instructional images, videos and phone support you or your contractor should be able to accomplish the project at a rate of 3 – 4 windows per day. Alternatively, for larger, whole house projects, installation by Heirloom Windows can be arranged. A lot of technical concepts are mentioned above, but each one is addressed on their website. www.heirloomwindows.com Go there for more detailed explanations. Magnum windows come with ¾” insulated glass, with or without various Low-E coating and argon gas fill. Magnums are thicker and require some slight modification of existing jambs. This is the most cost effective thermal option Heirloom windows offers. Are identical to the Magnum Series but with single glazing (monolithic) rather than a dual sealed IG systems. UniLites fit existing jambs and can be modified for commercial applications. If cost is not a significant concern, UniLite Standard with “VIG Storm Windows” are the ultimate solution. Are UniLite windows with optional distressed glass, just like 150 year old glass. Heirlooms customers have frequently commented that they are loath to abandon their “Old Window Glass”, with all its distortion and imperfections. Heirloom is now offering “wavy glass” as a UniLite option for those who appreciate that historic characteristic. Is a bit of a misnomer since there are actually two lites of glass in this system. However, it’s so thin it looks like a single unit. VIG is two 1/8” lites separated by 0.2 mm with that space vacuumed to remove all air. A ¼” VIG unit provides the same thermal efficiency as a full 1” standard Insulated Glass Unit. With jamb depth a limiting factor, ½” of VIG provides 1-1/2“ more sash depth and shadow lines for a much more historic look with an order-of- magnitude more thermal efficiency. See “Spacia VIG” for more info. Spacia VIG is a special product and not universally applicable. Please consult with Heirloom to determine feasibility. TDL is an oft bandied about phrase but the ramifications are usually misunderstood. A true divided lite window requires at least ¼” of division (muntin wood) and 3/16” of glazing rebate. So the minimum muntin thickness would be 5/8”. However, most IG units have at least 7/16” of spacer, meaning a minimum of 1-1/8” of muntin is required with no allowance for fit or expansion. Realistically a 1-1/4” muntin is appropriate for use with IG or VIG units . The point being that TDL is only applicable with monolithic systems (requiring no edge spacing). Heirloom Windows can, and will, do TDL but only with monolithic glass, either float glass or “wavy glass” – not IG or VIG. The Old House Guy preaches Restore, Preserve, Maintain, but if you ARE going to replace your windows, Heirloom windows has the best products for your old house. Very helpful article. I just purchased an 1895 Victorian style house. All the original “wavy glass” windows are non functional and I wanted something to match the original style. Thanks for the help! I’m doing an addition. My historic colonial has none of the original Windows. I’d like to eventually replace all of the Windows. Would you recommend Heirloom or Marvin? Heirloom is for sash replacement. Hopefully you still have your original frames. This article contains just the information I was seeking. We need to replace windows for energy eficiency purposes and humidity. I am done with regular window sales people, they don’t care about style. I am afraid of looking “up” to a more specialized company, but afraid it will cost a fortune. I think the ideal would be high end windows in areas where they are more visible, and back second floor less costly windows, is this a mistake? This is a ridiculous statement! This tells me you didn’t read all the information on the website. Storm windows are the answer for your original windows. We have a 1923 Chicago tudor style stucco house that was remodeled during the 1990s with white vinyl anderson windows. They were installed incorrectly are leaking and look awful with the brown trim. We’ve lived here four years and I really want to replace them but am afraid to make things worse. None of the old windows are still in the house so I don’t have anything to start with. I am not sure what was here before but in looking around the neighborhood, I suspect it was casement windows. I started looking at windows and don’t trust any of the vendors to do what is right by the house. Do you have a company that makes replacement windows that you trust to steer me right? Hi Patti – There is a listing of window restorers here. http://www.oldhouseguy.com/windows Hope there is someone in your area. Good luck! We live in a house that is 24 years old. We had Antcliff casement windows. Two years ago we had sunrise Vanguard windows put in, and it was a horrible experience with the company who did the install. We are not satisfied with these windows in Michigan. They are fiberglass would looking. The Woodlook is beautiful, except when it gets warm and cold corners of what looks to be a vinyl product peels up and then lays back down. We have had a couple of those sections replaced. When it’s windy, we feel drafts. …. like I said these were installed approximately two years ago, but since we had 17 windows total, we decided to do only the back of the house at the time. We are now hoping to do the front of the house, but do not want to use this company or the people who installed it. Reading this article above made me wish our home was an older home! Are there any companies out there who make a reputable window that we could get a close match to that “Look” of the new ones? We are feeling desperate, as the windows in the front of the house are in great deterioration. They are wood windows, but they had mold in them. I stripped them down about five years ago, Cleaned up, and treated the windows for the mold, and re-stained them. Within six months they we were beginning to do the very same thing all over again. It is been a huge battle, but now the windows themselves along with all the casement is deteriorating quickly. We live in Michigan, and we want to replace the front windows of the house with something that is a quality we can trust for years to come. Any advice or information would be greatly welcomed! Is it possible to replace old, ugly, replacement windows with original ones? I found a few people who are putting in new, modern windows and getting rid of their original wooden ones— but they only saved the sashes. Can the frames be rebuilt with new lumber? How hard would that be? If the windows are the right size you may be able to do it. Consult a carpenter. These are replacement windows, but I wonder if they can be used for new construction? My husband and I are building a new “old” house, and I can’t imagine going with vinyl windows. I need the look of original wood. Any suggestions?